The CKAS Thruxim, Thruxim Max and Thruxim Pro are the ultimate home use motion simulators for gaming, with high fidelity 2DOF, 3DOF or 6DOF motion systems, and convenient upper structure to get you in a motion simulator immediately. These units have been the culmination of all of CKAS' professional experience in commercial simulators focused on what is important for private enthusiasts. Please ensure to read the IMPORTANT INFORMATION at the end of this page when selecting a simulator. The CKAS Thruxim family of simulators are based around the high performance low cost CKAS motion systems, the T2s 2DOF, the U2s 3DOF and the W3s 6DOF Motion Systems, which feature some incredible response and fidelity (shown clearly in the videos below). The Thruxim units allow a home user to "instantly" build a motion simulator from typically available components such as monitors and gaming controllers, often already purchased for previous home set ups, and finally adds the most sought after quality of a real simulator - motion. Flat packed raw MDF rigid Thruxim framework and assembling hardware (screws/brackets/etc) which requires some very basic assembly to hold the main structure on the motion platform and provide a “table top” for controllers such as steering wheels or yokes (Thruxim Pro comes with extra re-enforced frame for higher impact motion). Rigid prefabricated steel structure to hold up to three typical 24” LCD or LED monitors (VESA 75 or VESA 100 mounting holes) for total immersion. Folded steel brackets for mounting a typical “auto” style seat to the motion system. 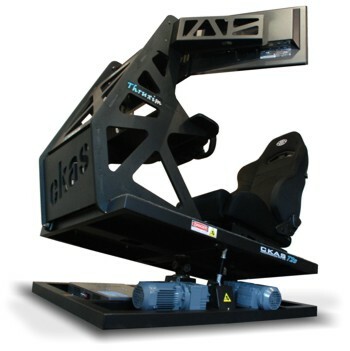 Seat is not included – Due to the awkward shape of a racing seat and typically heavy weight, it is very costly to ship them from Australia, and they are always available locally much cheaper from an automotive parts supplier. A representation of the inclusions is shown below for clearer understanding. Any Client program which is developed to send Serial Data (only for very advanced users for 3DOF and 6DOF units for this interface). In Australia, the unit will be shipped to your door, and there must be lifting equipment or personnel on site to unload the delivery truck. For overseas customers, CIF shipping is "Cost, Insurance and Freight" which means we will Air Freight the unit to your local International Airport (must be major Airport) where you must pickup the unit, clear it through customs, and pay any import duties to your local government. If you wish to organise your own shipping from Tullamarine, Victoria, Australia, the delivered package sizes are shown in the "Shipping Size" and "Shipping Weight" above. 3 or more CKAS Thruxim units of the same type will attract a discount for the unit cost. In many cases, the customer is not always entirely sure as to wether to purchase the 2DOF, 3DOF or 6DOF unit. The selection always comes down to the following 3 key parameters, budget, customer, application. The table below will assist our customers in selecting the appropriate product depending on application. Fixed wing flight simulator (Aeroplane) Suited to low cost simulators which require motion and mostly used as entertainment. Will be lacking in many sensations such as asymetric flight ,take-off heave and ground handling. Not suitable for demanding clients. A good compromise on motion, and excellent value for money. Many sensations however, especially relating to asysmetric flight and ground handling will not be replicated. Not appropriate for demanding customers. The best alternative if the budget allows. This unit will allow for the replication of all sensations with excellent fidelity. The only solution for the demanding customers. Rotary wing flight simulator (Helicopter) Not very well suited to helicopter simulators, unless used for entertainment. Only appropriate if the attitude is "some motion is better than no motion". Not suitable for demanding clients. A good compromise on motion, and good value for money. but the missing yaw axes will be very noticeable. Not appropriate for even slightly demanding customers. Typically the only solution available. If the budget allows for this, then it should be used. Many sensations in Rotary wing aircraft require full 6DOF. Domestic driver training simulator Suited to low cost simulators which require motion and mostly used as low speed driving simulators (such as truck and bus). Will be lacking in many sensations such as loss of grip, rough terrain and rapid lane change. Not suitable for demanding clients. A good compromise on motion, and good value for money. Will be lacking in some sensations such as loss of grip and rapid lane change. Not suitable for the most demanding clients. Could be a little excessive for low cost slow vehicle driver training (bus or truck). For domestic vehicle driver vehicles, will offer the best simulation by far. 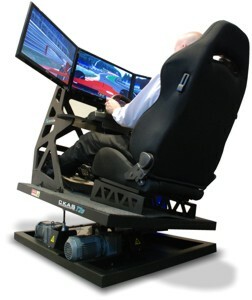 Racing vehicle simulator Suited to low cost simulators which require motion and mostly used as entertainment. Will be lacking in many sensations such as high speed direction change, ground bumps and loss of traction. Not appropriate for Rally style racing. Not suitable for meticulous enthusiasts. A good compromise on motion, and excellent value for money. Many sensations however, especially relating to loss of traction, will not be replicated. Not appropriate for demanding customers. Very well suited to fast response simulation, and will replicate all sensations very well, including acceleration onset, braking, loss of traction, rough terain, ripple strips and lane change. If the budget allows, this will satisfy the most demanding customers. Rail vehicle simulator Not very well suited to rail applications since they require dominant surge and sway, unless used for demonstration of concept. Only appropriate if the attitude is "some motion is better than no motion". Not very well suited to rail applications since they require dominant surge and sway, unless used for demonstration of concept. Only appropriate if the attitude is "some motion is better than no motion". Typically the only solution available. If the budget allows for this, then it should be used. Military vehicle simulator Not very well suited to military grade simulators, unless used for demonstration of concept. Only appropriate if the attitude is "some motion is better than no motion". Suited to some low end simulators, but will be lacking in many sensations. If the budget allows, choose 6DOF unit. Suitable for this application, but the 3DOF unit might be better value for some simpler simulators. Research simulator Not very well suited to research facilities such as universities, due to the limited scope of performance and testing available. Could be suitable if required for specific application only. Not very well suited to research facilities such as universities, due to the limited scope of performance and testing available. Could be suitable if required for specific application only. Typically the only solution available, with the least restrictions on research, and the most scope for future projects. If the budget allows for this, then it should be used. Application with dominant "heave" action Not suitable. Suitable for this kind of application, as long as there are not too many dominant surge, sway and yaw motions. Suitable for this application, but the 3DOF unit might be better value if the surge, sway and yaw motions are limited. Application with dominant "yaw" action Not suitable. Not suitable. Typically the only solution available. If the budget allows for this, then it should be used. Application with high frequency motion in horizontal plane (surge, sway) Not suitable. Not suitable. Typically the only solution available. If the budget allows for this, then it should be used. Application requiring high fidelity Not suitable. Not usually suitable, however, may be suitable to special applications. Typically the only solution available. If the budget allows for this, then it should be used. Before purchasing any motion system product for home use from ANY manufacturer, please consider the following very important information, especially when considering competitor products to the Thruxim. Robustness and Professional Design - CKAS systems are used by companies such as NASA USA, Australian Defence Forces and other Military contractors. Our systems are very serious in construction and design, and we use only the finest German Actuator hardware to make sure the system works as it has been designed. Our machines are all designed by professional engineers who are trained in developing robot structures, which are designed not only to "work once", but rather to endure fatigue, and perform for a long time with high fidelity. Many competitor systems are simply built by enthusiasts who have some great ideas, but lack the engineering skills to "design and manufacture" a system for consumer or professional use. Realistic Simulation - All CKAS motion simulation algorithms are of the highest academic quality. Our algorithms are certified in commercial driving and aviation simulators, and offer the highest fidelity and response. 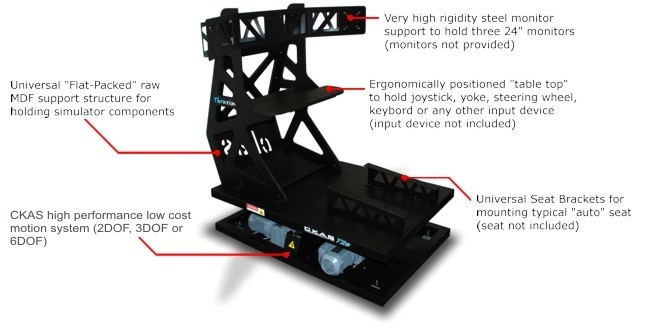 Many competitor devices which require an independent screen that is not mounted to the motion system are not producing a simulator at all and are inappropriate for use by serious enthusiasts. This is especially bad when a large angle swing is also integrated into such units as it is HIGHLY unrealistic to be accelerating and trying to see the TV in front of you when you are tilted back and looking at the ceiling. Replacement Parts and Spares - CKAS systems are designed with almost entirely "commercial off the shelf" (COTS) components, which are provided by large scale multinational manufacturers. This means that sourcing spare parts for our systems long into the future will be trivial, since the use of commercial technology ensures high life times and support for spares. Most of our competitors will "fabricate" or cobble together "special" actuators from flimsy components like small stepper motors and DC hobby motors and expect them to service continued use. The sourcing of spares in this case will be required often and will be very difficult. CE Conformance - The CKAS system conforms to the stringent European Standards and Directives for use in the Eurozone. Our system must pass hundreds of tests involving Essential Health and Safety and Machine Design directives, and also comply with Electromagnetic Emission Standards. If you plan to import a competitor system into Europe, which does not conform to CE directives, it will most likely be stopped by your Customs Office.